I applied the wraps as per the Jamberry instructions, and did an accent nail of white with a row of black rhinestones down the middle. The reversed colors look awesome with the wraps, if I do say so myself. Here's the cool part. Melanie, the Jamberry consultant I have been working with, has agreed to donate a set of these very wraps for me to use in a giveaway for you all! BUT THERE'S MORE! I am also contributing the rest of the pieces you need to recreate this manicure. 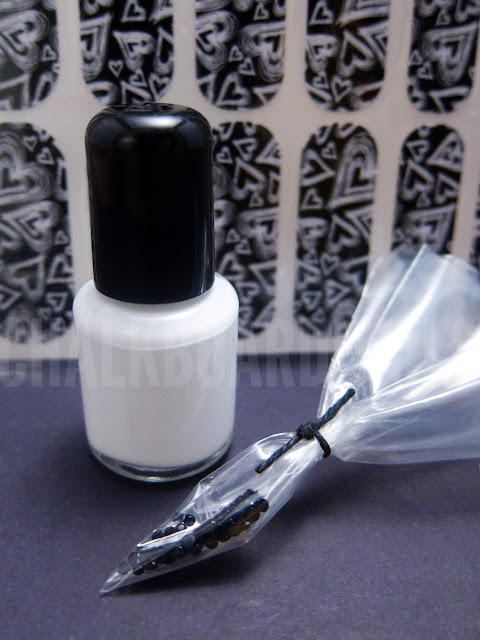 In addition to the wraps, the winner will receive a 7ml decant of Essie Blanc, and a baggie of black rhinestones. Fun! Giveaway ends Monday June 11, 2012. I will then draw a winner, who will have 48 hours to respond once notified. If they do not reply in time, a new winner will be chosen. This giveaway is open internationally. There are two available entries. One for just reading my blog, and another for liking Melanie's Jamberry Facebook fan page. If you'd like to purchase Jamberry Nail Shields, they are available here for $15/sheet. Wow! this look much better much beautiful in your finger nails! 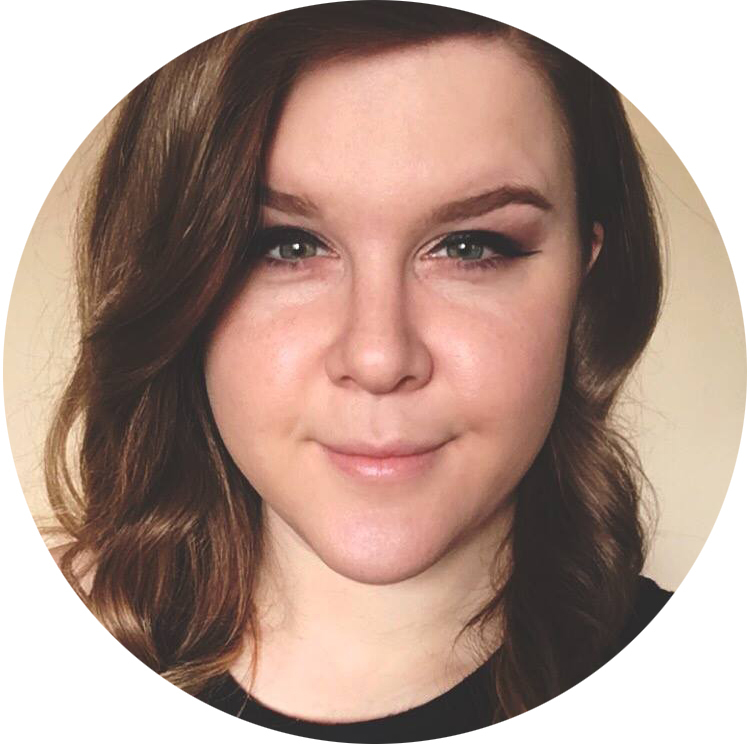 This is such a fab giveaway, Sarah! this mani looks SO MUCH FUN!!!!! I love those, the hearts are so cute! love the mani, and thanks for the giveaway! Entered the giveaway, gosh I'd loooove to win these plus the rhinestones! The design is so adorable and definitely perfect for you and your blog name! ha ha! Do these come off with nail polish remover just like Sally Hansen Salon Effects? Nope! These are made of a non-toxic vinyl material, so they will not chip or scuff like the Sall Hanson ones. So to remove, you need to heat up with a blow dryer and then peel slowly. They will last for 1-2 weeks on fingers and 4-5 weeks on toes! Sweeeeet manicure! Thanks for the giveaway :). Thanks for the giveaway! I love this design! It is so neat, beautiful! Thanks for the giveaway! Awesome! Love the chalkboard hearts and the accent nail is superb as always. I love, love, love your site! Thanks for the giveaway! Funnily enough, my mom had JUST posted a link to these on my facebook wall yesterday because she knows my newfound obsession with nail art and the girl who sells her her Miche handbags is going to start selling these too I guess. Unfortunately, I don't have the dough to shell out for these babies right now (being broke is really not helping me support my nail polish habit!) but I think they are so cool--and I love the long-lasting wear that these have because of their material, versus the SH "sticker-type" ones--which are also too expensive for me to try right now lol. thank you so much for the giveaway!! June 10th is my birthday (no kidding).. really wish I could win this!! haha. So awesome!! Your accent nail is perfect with this design!! The Nail Design Is Absolutely Gorgeous!! The nail accent really makes this pop! I may try to re-create using my Bundle Monster stamps. Thanks for the fabulous post! becomes uneven and the edges crumble and then the nail starts to loosen away from the nail bed.